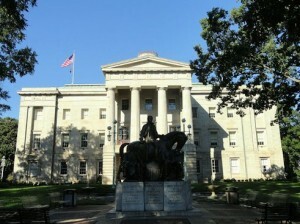 NC State Capitol – Raleigh. In remarks at the end of his first year in office — the first year of the Republican supermajority in Raleigh — Gov. Pat McCrory cited the state’s tumbling employment rate (down 2.1% for the year) as proof that his policies are improving the NC economy. “At times we had to endure short-term pain for long-term gain,” McCrory said, referencing a range of controversial policies that have generated intense opposition, embodied by the Moral Monday protest movement. But the dropping unemployment rate masks a troubled state economy. Since January, NC has actually lost about 8,000 jobs, and the labor force has shrunk by 118,234 (2.5%). In an interview with Why We Worry, Allan Freyer — an economic analyst for the NC Justice Center — said the labor market is still struggling to recover. “The big factor here is that most of these drops in unemployment are not related to job creation. They are related to people who can’t find work giving up and dropping out of the labor force altogether,” Freyer said. A major piece of the Republican agenda has been to make deep cuts to the unemployment insurance program (UI). Early in the year, they slashed maximum benefits by 35% ($185 per week) and shortened their duration. The reforms also caused NC to lose eligibility for $700 million in aid from the federal government. In addition to repairing state finances, this policy was supposed to spur job growth by discouraging dependence on government assistance. This entry was posted on at 12:58 pm, filed under Economics, Misc., North Carolina and tagged #ncpol, Allan Freyer, NC Justice Center, Pat McCrory, unemployment insurance, unemployment rate. Bookmark the permalink. Follow any comments here with the RSS feed for this post. Both comments and trackbacks are currently closed.